The item Buck wild, (electronic resource) represents a specific, individual, material embodiment of a distinct intellectual or artistic creation found in Austin Public Library. 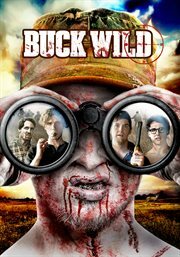 BUCK WILD is a tongue-in-cheek adventure that turns the buddy comedy upside down while tearing zombies inside out! Craig Thompson's idyllic hunting trip with his two buddies and unstable cousin is wrecked after hearing that his fiancee and best man-to-be have been cavorting behind his back. To make matters worse, Craig's cousin appears to be on the verge of a murderous rampage, while a rapidly spreading Chupacabra virus is transforming locals into the undead. After taking drastic measures to protect themselves, the boys must put aside their differences to survive an insidious hillbilly gang and impending zombie melee. Things are about to get BUCK WILD!